He’s not here for any particular reason. Several folks over at WAOD were talking about how hot he is and I had to check him out. Hot doesn’t even come close. Dude is hot like Damn and Whoa. I definitely feel a papi chulo story coming on. My only complaint? No nekkid pictures. Dude needs to take a page out of the Jonathan Rhys Myers/Viggo Mortensen playbook and get nekkid for the cameras. Hot guys should always have nekkid pictures available. Do you hear that Troy Polamalu? Why is it that I can find an internet full of pictures of old shits like Steve Harvey, but none of this little bit of lusciousness? Life just isn’t fair. Muy caliente! That’s all I got to say. He is yummy…and, damn has it been fun watching him grow up. He started out on the show Roswell. 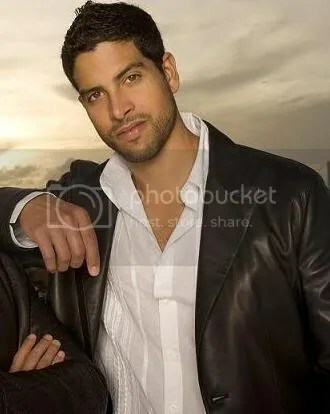 He is the only reason I tune into CSI Miami. Pure eye candy. Yes, yes! And you’re right…there’s a double standard at work here. Women do it. I don’t want to see Steve Harvey’s greasy chest, either. LOVE him… absolutely love him! ROFLMAO re: finding that Harvey ISH. Bleh!!!! Read the same thread, thanks for saving me the internetz search…. papi chulo indeed! !